Advantage Book Binding can provide round cornering in case binding, perfect binding, PUR binding, and mechanical binding. 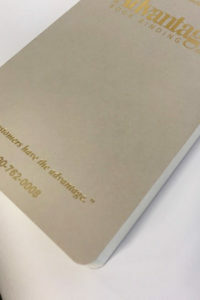 With the full range of materials available to us for covering your book products, we are still able to provide rounded corners, even with leather or heavy paper stock covers. Round cornering can give your book or paper product a softer look. It is especially popular for products like journals. A more rounded cut can also be great for children’s books to eliminate the hard edges and covers that can pose a potential hazard. Rounded corners are less likely to cause injury when young children are involved. When using round corners with a material such as leather, the book product becomes even more specialized and unique. Advantage Book Binding can make your product feel more accessible and less harsh with rounded corners. They allow for the same easy accessibility to your book or paper product, but with a nicer aesthetic.